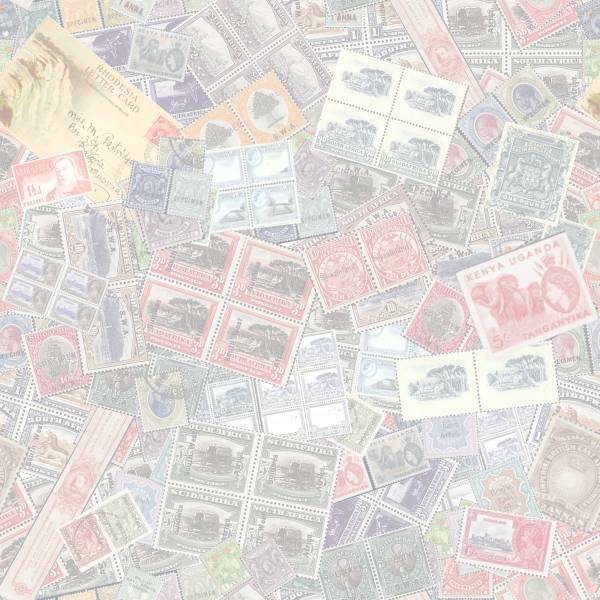 Many years ago I began asking philatelists what they considered to be the Union’s rarest varieties, my question seemed to surprise most people and their tentative replies varied considerably. Having researched the Union varieties on and off for some time, I have accumulated numerous illustrations, mainly from auction catalogues. The aim is to determine the numbers that might exist and also to attempt reconstructing the relevant sections of original pieces. It is a pity that so little has been published on the major varieties of the Union and I hope that my articles might attract further input providing a considerable contribution to South African philately. In general most people regard the double print on the 1913 ½d King’s head as South Africa’s rarest variety and for many years it was the highest priced Union item in the Stanley Gibbons catalogue. Visually I do not find it impressive and on the five known examples the doubling on each stamp varies from seventy to ten percent. As a result I have not been tempted to acquire this particular variety. The major Union varieties include double prints, missing colours, watermark, overprint and perforation errors. 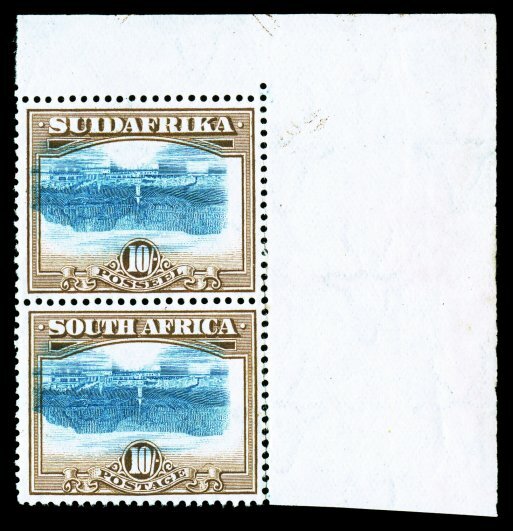 An inverted centre exists on the 1927 10/- Table Mountain definitive. Five examples were found in the famous Charles Nissen stock sold to Stanley Gibbons in October 1977 for a price of £861,000. This impressive variety is said to have come from printers waste. I have often heard collectors complain as to why Gibbons do not list certain variations, however in the front of each Stanley Gibbons catalogue under Information and Guide lines a clear and specific criteria is given as to which types of varieties they do or do not list. Other specialized publications that include odd ball errors and varieties, some caused by intrusions, fold over’s or mis-perforation include the defunct Robemark loose leaf catalogue, the current South African Stamp Colour Catalogue and of course the various editions of the Union Handbook. Many of their listings are beyond the scope of the Stanley Gibbons catalogue. Several Stamp dealers, myself included, have often contributed to the discovery, listing and pricing of Union varieties. My first claim to fame was in early 1980’s when I bought a 2d Official pair as SG 035, but it proved to an inverted overprint, now listed as SG 045a. The Union Handbooks are a wealth of information, the last edition appeared in 1986, one would anticipate that this ought to be the most up to date, comprehensive and accurate publication, but sadly it is not. To fully appreciate the value of the Union Handbooks it is necessary to work through each edition and carefully extract the relevant information. The early handbooks were produced by individuals such as G.W. Reynolds 1924 - 25, J. Ritchie 1926 and L. Simenhoff in 1931. In 1946 The Philatelic Federation of Southern Africa took over the task of producing a handbook. Their next edition appeared in 1952 followed by a Part II in 1955, then the 1960 Golden Jubilee edition combined the foregoing and the last two were published in 1979 & 1986. I have noticed that certain items listed in the early handbooks were excluded in later editions. I believe the reason for this was that some varieties effectively ‘disappeared’ - they were not seen or traded and some of the Union’s rarest varieties remained in the hands of the same families for decades. Price comparisons between varieties in early editions set against prices in subsequent handbooks, are useful and a worthwhile exercise. I noticed that some of the rarest items were forgotten or neglected and in later editions were either grossly devalued or simply deleted. For example in Simenhoff’s 1931 catalogue a Professor J.J. Smith is named as being the owner of the double prints on the ½d Kings head and the 1926 ½d Springbok. Smith passed away in June 1949, his obituary appeared in the August 1949 S.A.P. 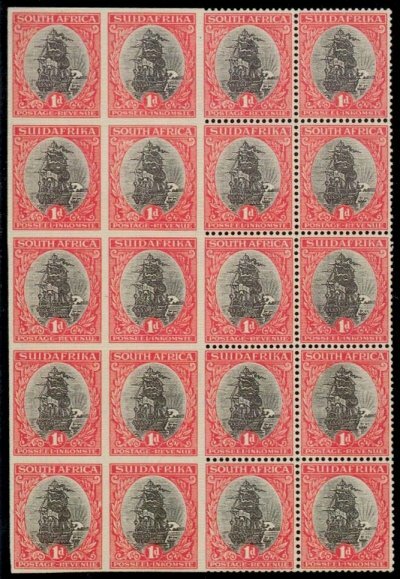 and his collection also included a unique block of eight of the unhyphenated 3d Groote Schuur missing the frame colour completely on five stamps and partially on the other three. The 3d missing frame featured in the1946 Handbook valued at £40 and at that time the ½d Kings Head double print was quoted at £60. The 1952 edition included the 3d variety unpriced and it was omitted from the 1960 - 1986 handbooks. After 60+ years in the Smith family, several of their important varieties were sold and the 3d block of eight appeared in an April 2000 Stephan Welz sale, Stanley Gibbons listed it the following year as SG 45f and it is now the highest priced South African stamp. 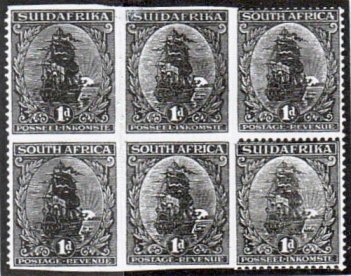 Another forgotten major variety was the 1926 ½d Springbok with a double print, only three pieces are known. In my opinion it is more impressive and rarer than the one on the ½d Kings head and this was reflected in the 1946 handbook pricing the Springbok at £90, fifty percent higher than the Kings head. Yet the Springbok double print also slid into obscurity, not deleted from the handbook, but devalued out of all proportion and in the 1986 edition it slid to a mere R2,000 against R10,000 for the ½d Kings head. Thus in a period of forty years its value went from being 50% higher to 80% lower. 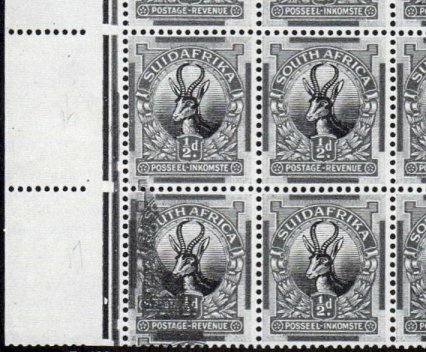 The Smith collection included a lower corner marginal strip of five of the ½d Springbok, the first stamp doubled completely and the second approximately half. Sold by Stephan Welz in November 1999 for R77,000 (£8,000). It made its debut in the 2002 Stanley Gibbons catalogue priced at a mere £300! In 2012 it was quoted at £3250 and then surprisingly it shot up to £20,000 in the 2014 edition. 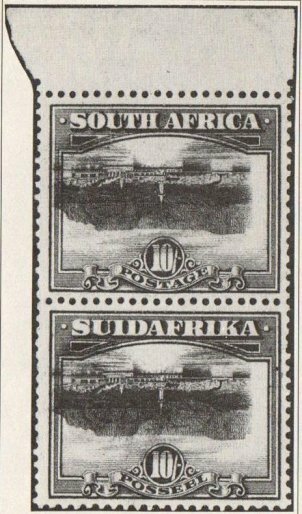 July 1926 The South African Philatelist on page 60. A Johannesburg philatelist, Mr Alex Bronks, has acquired a sheet of the halfpenny pictorial showing the green frame doubly printed on six stamps in the bottom left-hand corner, two stamps having the frame completely double printed, the second impression not being complete on the other copies. An illustration will appear in our next issue. Sadly no illustration, a three line note on page 66 explained, that owing to the variety having changed hands no illustration was forthcoming but they hoped to include it in the very near future. I looked through the rest of the 1926 (missing the December issue) and also the 1927 and 1928 S.A.P.’s - no illustration. In the July 1928 The South African Philatelist under Familiar names there is a picture of Mr A. Bronks, the notes indicate that he was a stamp dealer and an advertisement in the S.A.P. confirms this and his premises located at 16, Old Arcade, Market Street, Johannesburg. J. Ritchie listed the variety in his 1926 handbook and so did L. Simenhoff in his 1931 catalogue. a) Double printed frame plate, half stamp; row 17, No.1 (in strip) £25. b) As a, but one complete stamp and two partially. Row 18, No.1, row 19 No’s 1 and 2 (in strip) Collection H.T. Jones £95. No’s 1 and 2 in corner strip - Collection Prof. J.J. Smith £95. Approximately forty percent of the frame is doubled being a diagonal area covering the left corner. The contemporary report did not note that the stamp above on R16/1 also has a small area of doubling in its lower left corner. The variety is not in a strip as stated by Simenhoff, but is part of a left marginal block of forty two (6 x 7) being the first six stamps from rows 11 to 17. Part of a marginal arrow is opposite the first stamp on row 11. The second impression (doubling) of the frame on R17/1 extends upwards into the lower left corner of the first stamp on row 16. The collection consisted of a host of varieties and specialized material from Southern Africa and the buyers, often with a limited budget, were spoilt for choice. With almost 360 lots of South Africa in this sale it meant that lot 426, with the double print on the ½d Springbok, might easily be overlooked and the item did not even qualify for a colour illustration. This variety is illustrated in Runner & Mailcoach (1969) by Rosenthal & Blum opposite page 145. Unit two - Double Prints on rows 18 and 19: Ex H.T. Jones it was later included in the Jacob (Jack) B. Bloom collection. Jack passed away in 1992 and his collection remained in the hands of his family for many years and effectively locked away many of the Union's sought after rarities. Jack's example of the ½d double print was partially illustrated in the 1979 edition of the Union handbook opposite page 91 and left a question mark over the actual size of the unit. The foregoing illustration showed six stamps with three affected by doubling. The frame on the stamp from R19/1 is completely doubled, whereas on R18/1 it appears around 85% and approximately 20% double on R19/2. Bloom's Union collection was auctioned by Spink on 24 October 2013 and lot 2072 revealed a ½d block of twelve with the double print varieties, offered at £12,000 - 15,000 it sold for its top estimate - I was the underbidder! Unit three - double frame on row 20: This multiple is a lower left corner marginal strip of five with three normal stamps. Complete doubling on R20/1 and approximately half on R20/2. Ex Professor J. J. Smith collection, it was sold by Stephan Welz on 30 November 1999 as lot 388 - estimated R60, 000-80,000 it realized R77,000 (£8,000). This strip reappeared in a 1 November 2006 Warwick & Warwick sale as lot estimated at £5500 and sold for £5405 - In my opinion, someone got a bargain. The lucky Buyer sold his Union collection through Murray Payne and this famous strip was lot 449 in Auction No 14 on 12 March 2013. Estimated at £7500 against a catalogue value of £3250, it sold for a justifiable £17,500 - I was the underbidder! During 2009 a ½d used vertical pair from a booklet pane, perforation 13½ x 14 and cancelled BARBERTON 24 OCT 27 was submitted to the Royal Philatelic Society's Expert Committee by Tony Howgrave-Graham. On 15 July was granted a certificate No 202972 stating it is geniune. Next it appeared in the SACS Leamington Spa Auction and I bought it. Currently this pair is the only example of this particular variety and the Stanley Gibbons listing is entirely based on this particular pair. At the particular point in time when this error was found we may anticipate that its discovery would have been reported in The South African Philatelist but coincidently the S.A.P. was not published during the period January 1928 to January 1931. 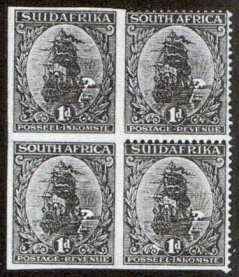 I searched through copies of the foregoing starting from the February 1931 edition but drew a blank and the 1931 Standard Catalogue of the POSTAGE STAMPS of the Union of South Africa by Simenhoff plus his February 1932 Supplement reveal no mention of the variety in question. 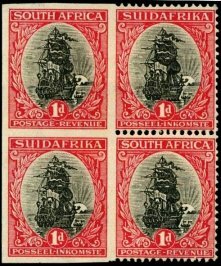 Finally in the next edition of the Union Handbook catalogue, published by the Philatelic Federation of Southern Africa in 1946, there appears the first listing of two perforation varieties attributed to the Pretoria Typographed 1d Ship stamp from Plate 3. The 1d Plate 3 includes a marginal characteristic of having three cuts in the Jubilee lines in the bottom right corner of each sheet. THE SHIP PENNY by Gordon Ward classifies Plate 3 as ISSUE No 4, dated 12 August 1929. Ward does not mention the above perforation varieties. The 1952 Union Handbook/Catalogue includes an illustration of a lower marginal block of four; the two vertical stamps on the left side are Imperforate on three sides, but it does not specify that the variety occurred on plate 3. As a result of the foregoing, the remaining Editions of the Handbooks - 1960, 1979 & 1986 list the imperforates under General varieties - Issues 1 to 3 and in the 1986 edition they are UHB 34 V39 & 40. SG 31a Imperf (vert pair) & SG 31b Imperf 3 sides (vert pair). On the London printings of the 1d Typographed sheets the perforation comb moved from left to right and in Pretoria the operation moved from right to left. Each stroke of the comb perforated one vertical row plus the top & bottom of the stamp to the left of vertical. Should the machine miss one beat of its intended sequence it will create a complete imperforate vertical row plus each stamp at left imperforate at top & bottom. In this manner the result produces one vertical row of stamps that is imperforate on three sides with the left vertical side perforated. This variety is UHB 34 V40 (1986 Edition) and is meant to correspond with SG 31b, although I am not aware of the existence of any mutilated vertical pair as described in the Stanley Gibbons catalogue. The block of four in Figure 1 illustrates an authentic example of a three sided imperforate variety. 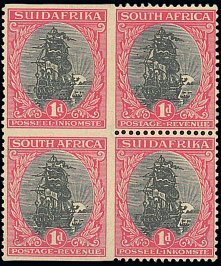 In a December 2011 Feldman auction, their sale included a used block of four cancelled at Johannesburg in 1934. Should the single comb perforator miss two consecutive beats it would then create one vertical row with stamps imperforate on all four sides and the adjacent vertical row with its stamps imperforate on three sides. I created a facsimile, illustrated as Figure 2, that demonstrates how it ought to look. Such a unit or a strip of three would prove beyond doubt that the centre stamp has four sides imperforate. Should one remove the middle vertical pair, it will match the Stanley Gibbons description of SG 31a. Known pairs and blocks seen are without the left stamp with three sides imperforate which does cast doubt on their authenticity. These stamps were perforated by a single row comb lying vertically on the sheet and reapplied to each vertical column in sequence. When applied with the horizontal teeth to the left of the vertical, which was usual, one beat of the perforator dealt simultaneously with the right side, top and bottom of every stamp in the vertical column. If a beat was missed, the right side, top and bottom were left imperforate. If only one beat was missed, this produced the error Imperforate on three sides which is catalogued. If two successive beats were missed, such an error was produced se tenant horizontally with a stamp totally imperforate. It therefore follows that if the left hand stamp of your pair has the right side imperforate (as it obviously has) it must have both top and bottom imperforate also, even though cut off above the level of the perforation holes. The real question therefore was, could the left side be accepted as imperforate? This is accepted as so by the Committee. A block of four, illustrated above as Figure 3, may raise a similar question as to whether the left side is really imperforate. In my opinion the margin on the left is wide enough to suggest it is genuine. A block ex Thys Rall featured in a 1 July 1992 Stephan Welz sale as lot 157 creates further confusion as the bottom lower right stamp appears imperforate at foot. In this instance a portion of perforations were trimmed off leaving only one isolated perforation at its extreme South East corner. Should the single comb perforator miss three consecutive beats it would create a sheet which includes two vertical rows with the stamps imperforate on all four sides plus an adjacent left vertical row with its stamps imperforate on three sides. Complete imperforate horizontal pairs may be taken from such a sheet. I am aware of only two multiples that suggest that this version exists; the 1979 UHB illustrated a block of eight (ex Naylor) on Plate XXIII opposite page 98. Stephan Welz & Co. in their 23 May 2001 sale offered as lot 566 a block of twenty in lot 566 - illustrated in Figure 5. We may again cast some doubt as to whether it is actually the product of three missing beats of a comb perforator, if it is why would anyone remove the vertical row on the left? Could it originate from a sheet with two missing beats with the vertical perforations at the left trimmed off? However the illustrated block does confirm that there was a sheet with at least two consecutive missing beats and the variety on a 1d Ship with four imperforate sides is 100% genuine. This Article appeared in the April 2012 S.A.P. The variety is more than likely Printer's waste that left Bradbury via the back door & came into the possession of the famous London dealer Charles Nissen. Stanley Gibbons bought the 'Nissen Stock' in October 1977 for £861,000 and amongst this holding was found a block of four and a single of the 10/- Table Mountain each with an Inverted Centre. From the known examples it appears that most of the vertical perforation were split thus it was practical to create two vertical pairs. There is also a single example with a wide margin that is detached from the stamp & has been rejoined. During the late 1970's & early Eighties Stanley Gibbons initially attempted to market the variety in South Africa. I believe it may have been offered in one of SG's early South African auctions, but there were no takers. Collecting stamps with inverted images is very popular in America. Thus the 10/- inverted Table Mountain found ready buyers on the US market. The Union of South Africa - The King's Head and the Pictorials by Mogens Juhl, FRPSL. He described the variety as: The Jewel of the Union's Stamps & provided an illustration. During the San Francisco International in 1997, this single was for sale on an American dealer’s stand. Alan Macgregor & I shared a stand at this show & we jointly purchased the variety. It was sold to a wealthy collector in South Africa & as far as I am aware he still owns it. We had a chat about the Upside Down Mountain variety. Given its sale price of $50,000 I feel certain that it was more than likely that the buyer is another collector of inverts rather than a Union collector. In the Gibbons catalogue their policy is to list & price South African bilingual stamps as pairs. Varieties such as missing colours are only listed as singles whenever the Country name is missing. For instance the Frame omitted on a 1d Ship, 3d Groote Schuur & 1/- Gnu - SG 43b, 45f, 56b & 62a. So why price SG 39a as a single when two bilingual pairs exist? It appears that this was done as a ‘Marketing Policy’ in order to make allowance for the single example. My own thoughts are that it would not go amiss if SG was to add a footnote to this variety.